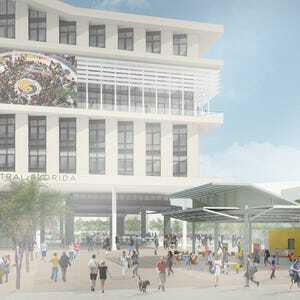 BB&T Corporation contributed $1 million yesterday toward the construction of UCF’s downtown campus. Banking company BB&T Corporation contributed $1 million yesterday toward the construction of UCF’s downtown campus, according to a press release. The contribution will go toward the construction of the campus’ $60 million academic services building, a 165,000-square-foot facility which, together with the renovated Center for Emerging Media, will house around 7,700 students. Of this funding, $20 million will come from UCF, $20 million from the state and $20 million from private donors. Private donors have contributed $17 million thus far. Previous donations include three separate $1.5 million donations from Florida Hospital, CFE Federal Credit Union and the Orlando Magic basketball team; $3 million each from the Dr. Phillips Charities and Orange County; and $2 million from Valencia College. Several other community partners have also contributed.